Sun Dong-yol, manager of Korea’s national baseball team, announces his roster in Seoul on Monday. SEOUL, June 11 (Yonhap) -- A pair of former Major League Baseball (MLB) players headline the South Korean baseball roster for the Asian Games announced on Monday. The Korea Baseball Organization (KBO), which overseas professional baseball leagues, and the Korea Baseball Softball Association (KBSA), which handles the country's amateur baseball, jointly unveiled the 24-man roster for the Aug. 18-Sept. 2 Asian Games in Jakarta and Palembang, Indonesia. Nexen Heroes first baseman Park Byung-ho, who had a brief stint with the Minnesota Twins, and LG Twins outfielder Kim Hyun-soo, who split two seasons with the Baltimore Orioles and the Philadelphia Phillies, were no-brainer choices in the lineup. Park is one of six infielders, and Kim is one of five outfielders. They're joined by 11 pitchers and two catchers. 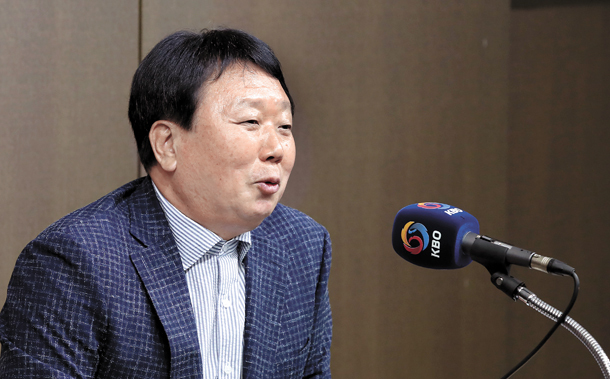 Manager Sun Dong-yol picked four collegiate players for his 102-man provisional roster in April, but none of them made the final cut, as all 24 players are from KBO clubs. South Korea is the two-time Asian Games defending champion in baseball. The KBO will go on an Asian Games break from Aug. 16 to Sept. 3 to accommodate the regional competition. Winning an Asian Games gold medal grants South Korean male athletes an exemption from mandatory military service. Some past Asian Games managers took heat for including some undeserving players apparently to help them get the military service exemptions. Athletes in sports such as baseball and football can complete their service while playing on military teams in a league with other pro clubs, but only those 27 or younger can apply for those spots. Sun had previously insisted he would look past players' military status and only consider their abilities, but he ended up picking two potentially controversial players who haven't completed their military service and who are past that age-27 limit: LG Twins shortstop Oh Ji-hwan and Samsung Lions outfielder Park Hae-min, both 28. Oh is batting .300 with four homers and 33 RBIs in 66 games. His career high for a batting average in a season is .280 from 2016, but batting .300 isn't particularly impressive in a league where 10 players are batting at least .340. Oh has also developed a reputation as a poor defender, though he's among the best shortstops this year based on advanced metrics. Park, a career .293 hitter before this season, is batting .304 with four homers, 30 RBIs and 14 steals in 65 games. The speedster led the league in steals in each of the past three seasons, with a combined total of 152 swipes, and could be a useful pinch runner at the Asian Games. Among other notables, Yang Hyeon-jong, Kia Tigers' ace and reigning KBO regular season MVP, will anchor the rotation. Choi Jeong, the SK Wyverns third baseman with 86 homers in the past two years, will lead the offense alongside Park Byung-ho and Kim Hyun-soo.